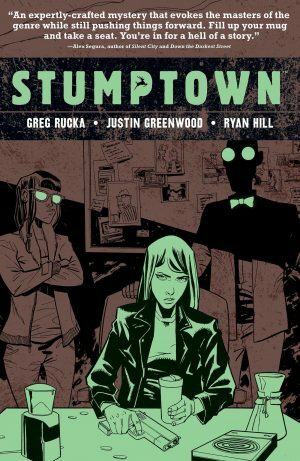 Stumptown’s Dex (short for Dexedrine) Parios is a car crash of a character, a down-at-heel Portland private eye who drinks too much, smokes too much, gambles too much… so far, so familiar. 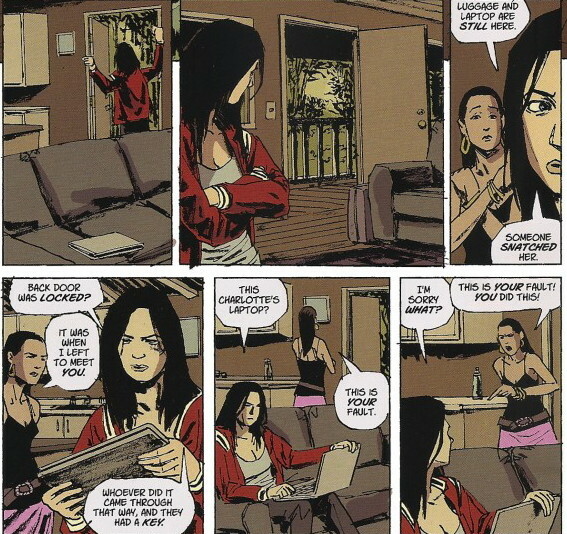 Thankfully, in Greg Rucka’s accomplished hands, Dex is more than a mere cypher. 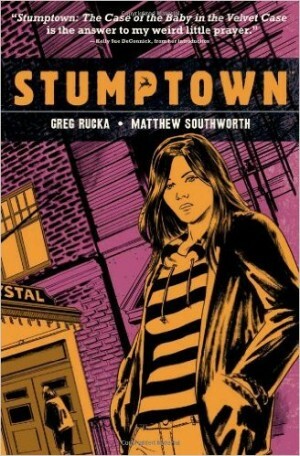 Rucka instils her with a rich, loveable, careworn humanity underpinned by a steely intellect and toughness along with a strong moral streak as she pursues a missing girl case. Despite her obvious flaws, she is a strong woman in a murky world populated by liars, cheats and ruthless thugs. 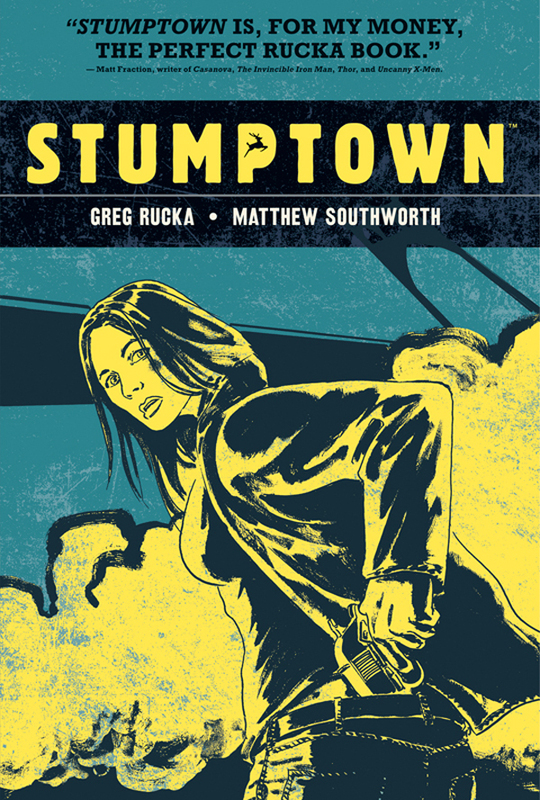 Rucka injects enough humour and pathos into Dex’s story to keep it safe from tumbling into hardboiled noirish cliché but he does tip his hat lovingly to a number of the genre’s conventions. That we learn only a little of Dex’s own back story holds out the promise that we will see much more of this character in the future and learn what dark currents and memories shape her self-abusive psyche. The creation of such a character is, however, only a starting point. Dex needs a world to breathe in and a rich landscape is provided, from the reservation lands of the Native American casino and the extravagant homes of millionaire criminals, to seedy bars and the homeliness of Dex’s apartment which she shares with her mentally disabled brother. We are offered a textured setting, a believable world captured skilfully in the wonderfully grubby art style of Matthew Southworth. The colouring, by Lee Loughridge, Rico Renzi and Southworth, complements the art perfectly, with the palette of blues, browns and ochres giving the pages a bruised and worn quality that suits the story perfectly. 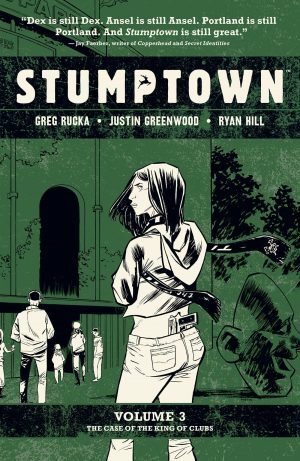 Rucka is a great crime writer and, in Stumptown, he has gifted us with another worthy heroine, a flawed, funny, rich character instantly elevated to his pantheon of strong, well-written, believable female characters. His take on Dex has shades of The Question’s Renee Montoya but this is not an environment colonised by gods and Superman; this is an environment occupied by the bruised and the bruisers. 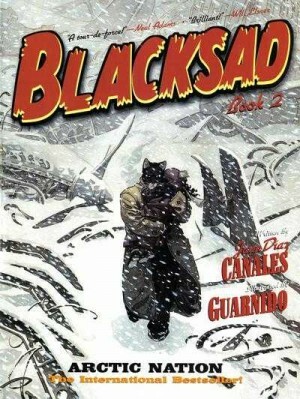 The narrative itself, quietly propelled along by Southworth’s storytelling skill, is a little low key but is given weight by the creation of such a rich protagonist whose company readers should look forward to sharing again in the following three volumes, starting with The Case of the Baby in the Velvet Case.